TOUCH OF CREATION: It looks like Christmas!!! I have one more beautiful Holiday project to share with you. DCWV has designed most amazing paper stack...I love it!!! DIY Project CHRISTMAS VILLAGE stack. Its a must have for holidays!! I made a decor for craftroom!!! It took me only 30 mins to make the whole thing without any die cutting machine or special tools. 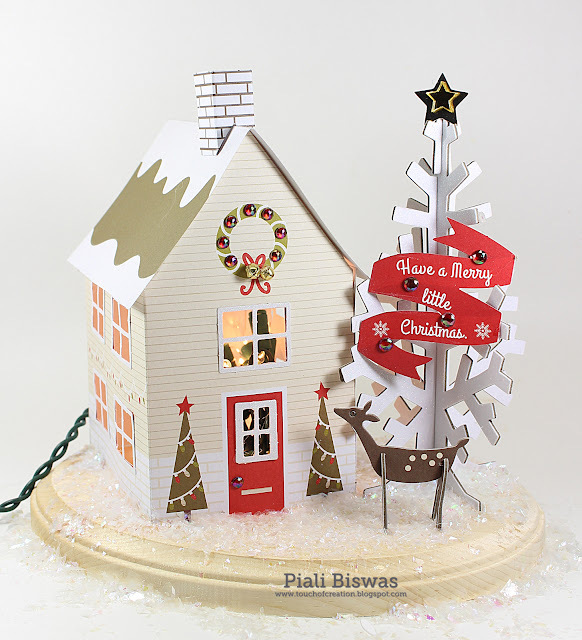 This stack comes with fabulous printed Christmas village house, which we need to cut and assemble. The window frames are the precut , we just need poppit out from the sheet and adhere with liquid glue. The deer is super cute!! Its a printed cardboard one, fits like puzzle pieces..easy peasy!!! The beautiful tree is the same, punch it out and fit in , it stands on its own. I embellished the wreath on the house with DCWV gemstones. 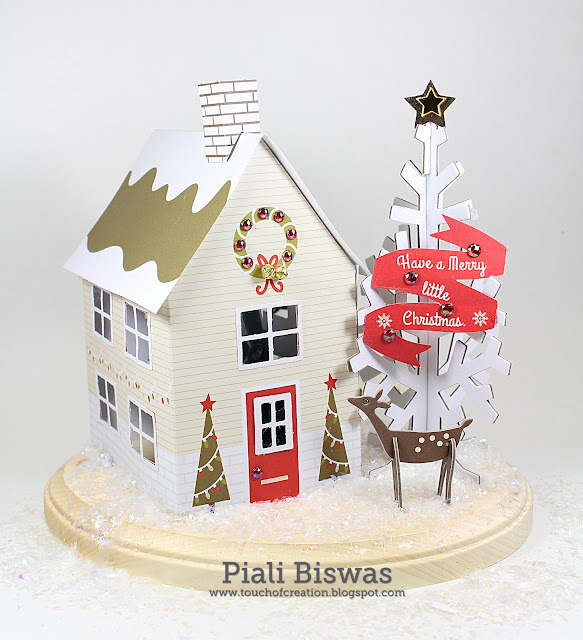 The banner is from new DIY Christmas Favor box stack. I adhered the house, tree and deer a wooden plaque. To create the snow scene, I applied glue and sprinkle fake snow on it. I got a small string light from the Dollar tree and added it to inside of the house....just plug it in and its beautiful!!! I wish I could get a better photo of the well lit house! Here is how it looks in a dark room. This will make a great holiday gift for someone. I'm planning on making few of these , next time I build the scene on the top of DCWV nesting box lids, then I can tuck in some gifts inside the box and the recipient can use the box as home decor and keep small stuff in it. H ope you like this holiday idea!! You can get these DCWV DIY stacks at Joann stores near you. WOW! That's amazing! I love that you light it up! Wow.. it looks so pretty..